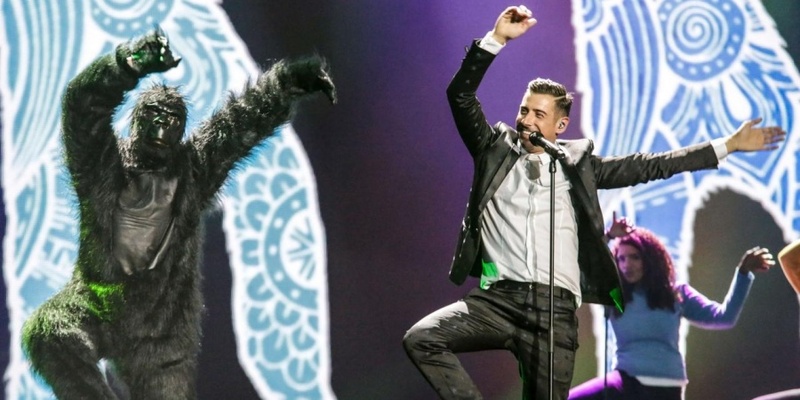 Italy's Francesco Gabbani (including gorilla) hummmm! The pre-qualified countries (Big-5 and Ukraine) rehearsed for the first time on the Eurovision Stage. Watch the videos (snippet) of the rehearsals from Friday. Earlier today, the first five countries from Semi-final 2 had their 2nd rehearsal. Before the 1st rehearsal each country gets instructions on safety, the dressing room area is presented, and there will be an In-Ear Monitoring Rehearsal backstage. After the 1st rehearsal each delegation go to the Viewing Room, to see the recording of the rehearsal. Here any changes on visuals, camera work, choreography, etc. will be discussed. After this, there will be a Makeup Consultation, and the Press Meet & Greet takes place.